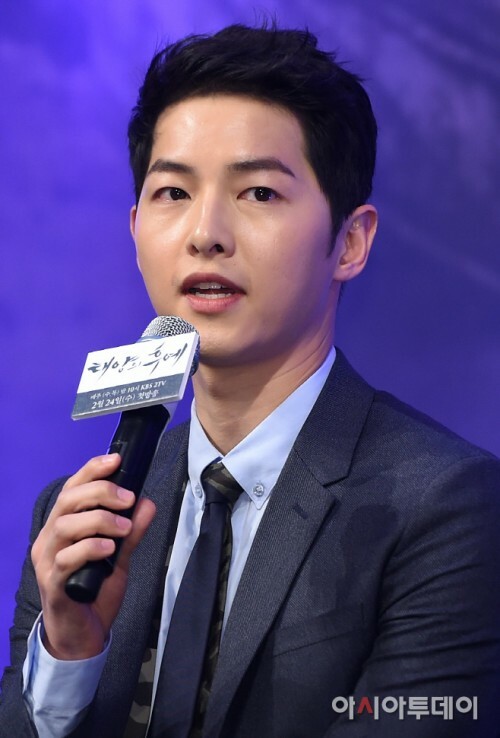 On February 22, Song Joong-ki and Song Hye-kyo attended the press conference for upcoming KBS2TV's Wednesday-Thursday drama "Descendants of the Sun" at Imperial Palace Hotel in Nonhyeon-dong, Seoul. "Descendants of the Sun" is about a love story between a captain in the UN peacekeeping troops and a doctor. They are both stationed in the capital of a fictional country that is ravaged with war and disease. Starring Song Joong-ki, Song Hye-kyo, Jin Goo, Kim Ji-won, Kang Sin-il, and SHINee's Onew, the drama premieres on February 24 at 10 pm.